Save 1% on the (3 Pack Value Bundle) PGC56037 Dish Power Dissolver, 32oz Spray Bottle, 6 per Case by PGC56037 at Blog Free Here. MPN: PGC56037. Hurry! Limited time offer. Offer valid only while supplies last. 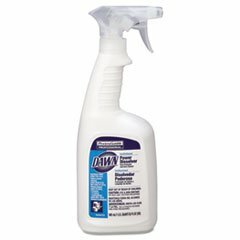 Get your dishes virtually spotless with a liquid spray grease dissolver. No scrubbing required and ideal for use on baked and burned on grease. Get your dishes virtually spotless with a liquid spray grease dissolver. No scrubbing required and ideal for use on baked and burned on grease. Pretreat your toughest pots and pans and wipe the grease away. Effective for pots, pans, dishes, stoves, ovens and grills. Application: Hand Dishwashing; Applicable Material: Ceramic; Glass; Metal; Plastic; Dirt Types: Cooked-On Grease; Dirt; Food Particles; Organic Matter; Physical Form: Liquid. If you have any questions about this product by PGC56037, contact us by completing and submitting the form below. If you are looking for a specif part number, please include it with your message.